Danger Kitchen Online Index available. Summer is the time of year for cooking outdoors. 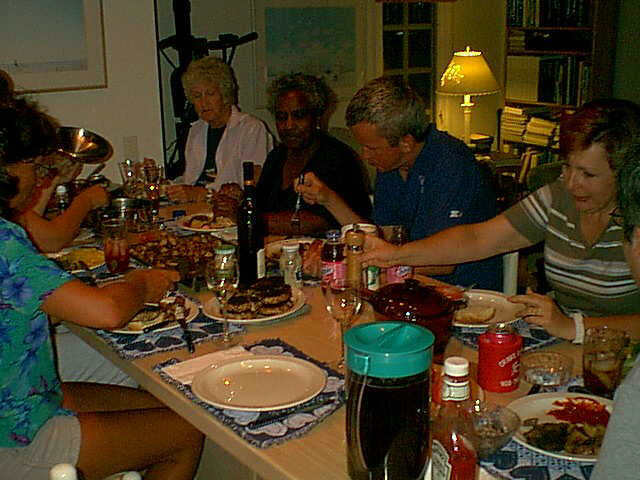 Grilled smoked and blackened food helps keep the heat of cooking out of the house, and really seems to hit the spot after a day on the beach. This recipe was described to me by Ken Muserlian, frequent Piper Geographic contributor and true trencherman, who had tuna burgers for the first time in a Miami restaurant. 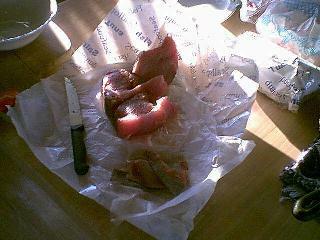 The yellowfin tuna seems to be the best to use for Sashimi and grilling or searing. It's dense oily meat makes the perfect burger as well. Despite heavy commercial and Sport Fishing, the yellowfin and big eye tuna don't seem to be in any danger as a species. They may weigh up to 400 pounds and stretch six feet long. Because of where they are usually captured, most tuna steaks have been frozen soon after catching. They are normally transported frozen, and thawed only for final sale. Short of catching our own, which could be quite a chore, this is the best tuna we'll see. This recipe may seem like quite a bit of trouble, but believe me, It's well worth it. There are also pre-packaged burgers available from Ibro Mar of Rotterdam Hollland, and Ocean Beauty, but I wouldn't recommend these if steaks are available, although they'll do in a pinch. This is a Danger Kitchen version of a popular recipe. > 1/2 to 3/4 pound fresh tuna steaks per person. > 1/2 pound butter melted. > Juice from 1 fresh lime. > 1 - 2 jars Chef Paul Prudhommes Blackened Redfish Magic. > Sliced red or Vidalia onion. > Remove the skin from the tuna steaks. > Grind them with a hand cranked meat grinder. > Make burgers 1/2 to 3/4 inch thick, as large as the buns. They don't shrink. 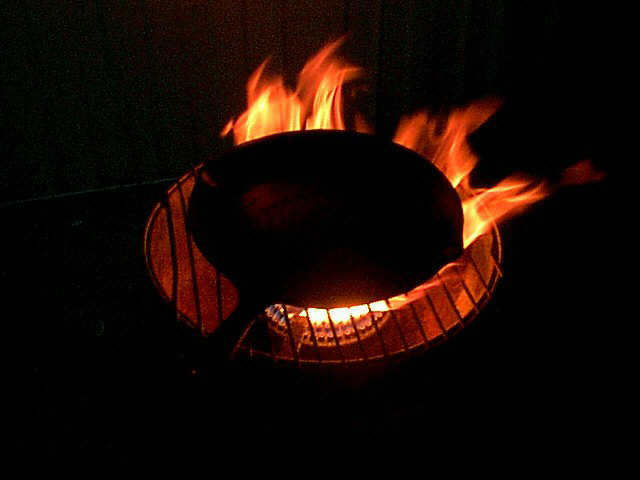 > Begin heating a heavy cast iron frying pan over high heat, outside. > Squeeze fresh lime juice and add to 1/4 pound of melted butter. Keep warm. 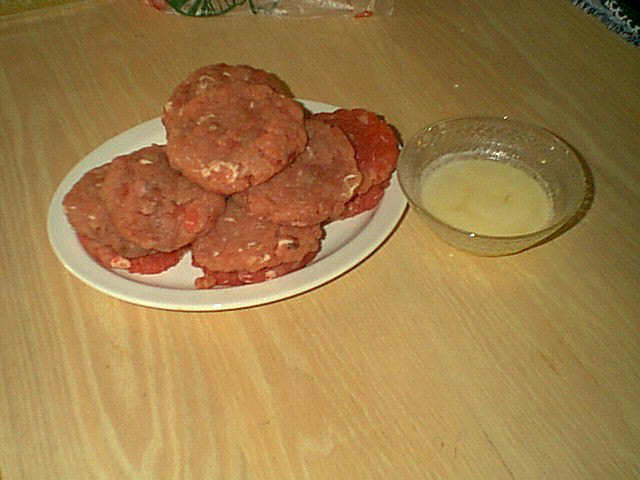 > Coat burgers both sides in melted butter. > Apply a generous coating of Blackened Redfish Magic. > The frying pan is ready when just starting to glow red in the center. 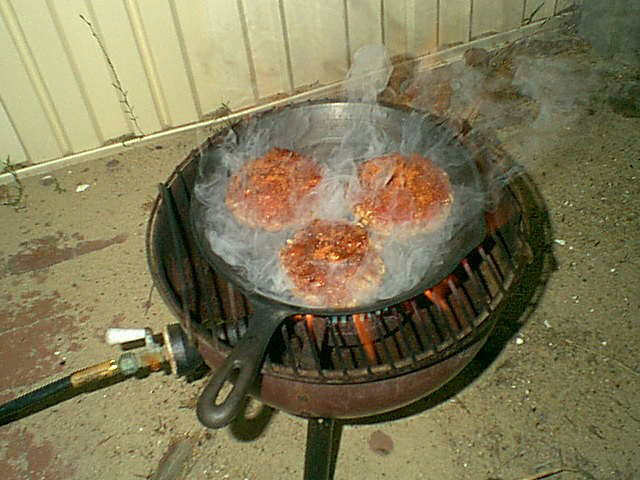 > Put the burgers in the pan quickly and stand back. The butter will flare up. 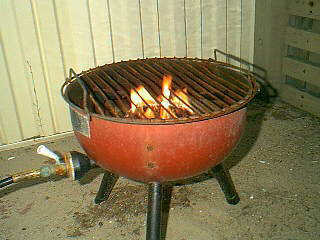 > Blacken for 1 to 1 1/2 minutes per side depending on thickness. > Burgers are best when medium rare. > Place a burger on a bun. > Drissle some lime butter on top. > Add some tartar sauce. > Add onion, tomato and lettuce. Beer: Anchor Steam, Geary's Pale Ale, New Castle Brown Ale. Wine: Johanesberg Reisling if it's hot out, or a Pinot Noir if it's cold. 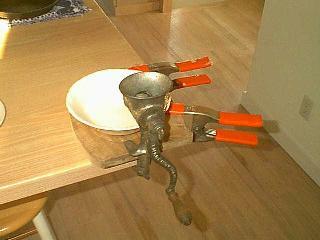 A hand cranked meat grinder works best. Once through. Tuna has almost always been frozen, and contains a fair amount of water. Remove the skin, and squeeze the steaks a bit and pat then dry with paper towels before grinding..
You have to push the steaks into the grinder. Don't be gentle. Watch you fingers. Drain the excess liguid from the bowl before making burgers. The burgers should be the same size as the buns and 1/2 to 3/4 inch thick. Remember, they don't shrink, and you need to be able t get the completed package in your mouth. Not too thick. Put the melted butter in a baking dish and coat the burgers thoroughly. 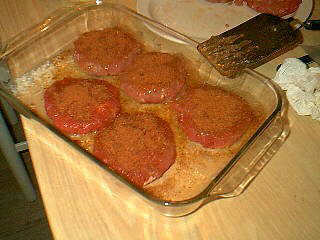 Cover them completely both sides with blackening spices. 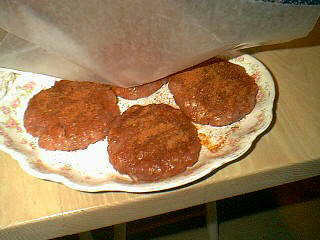 If you have a lot of burgers, it's best to stack them with wax paper between them. 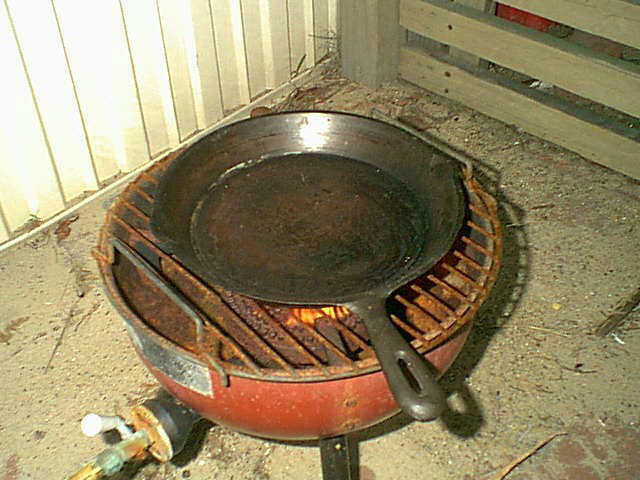 This is a Jacuzzi outdoor cooker. Brinkman makes a fine one as well. You have to do this outside. You need one of these. It's worth it. 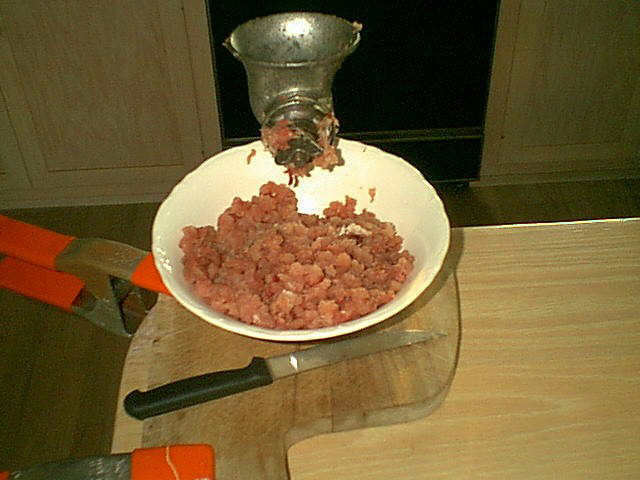 Start heating the pan before grinding the tuna. Gently at first. Heating a cold iron pan too quickly at first can warp or crack it. This pan is almost ready. It should have a dull red glow in the center. I think Iron begins to glow red around 1800 degrees. Don't touch the pan (Duh!) even with a pot holder. The pot holder can burst into flames. Be careful when you add the burgers. The butter can flare up, and splattering can be severe. Best to do this over bare ground, with nothing flamable near by. Seems like a lot of trouble, but the results are worth it.